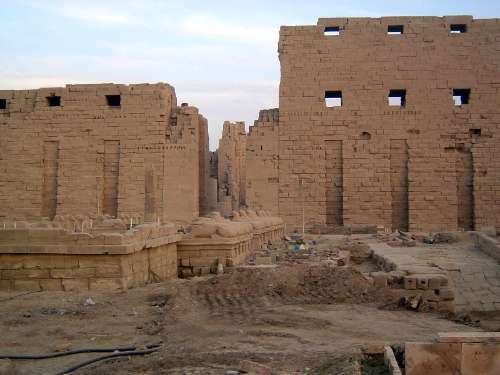 Karnak is the modern Arabic name for a village adjoining a place more properly called Ipet Sout, Most Esteemed of All Places. 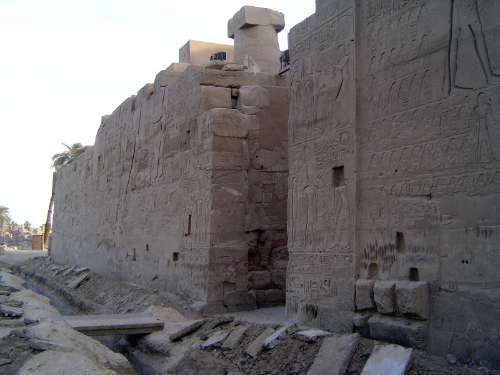 This was the home of Amen-Ra, his wife Mut, and their son Khonsu. This is the first of 10 pylons. The square channels in the lower part of the pylon held flagpoles that rose above the pylons. 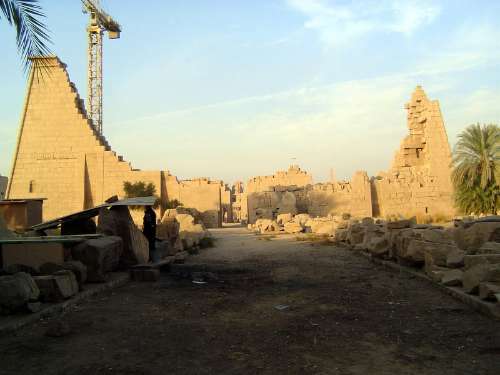 The wall at the left is the dock of a pool once connected to the Nile, several hundred meters behind the camera. It was a landing point, in other words. The criosphinx or ram-headed sphinx is a symbol of Amen, and the path to his temple led past this line of them. 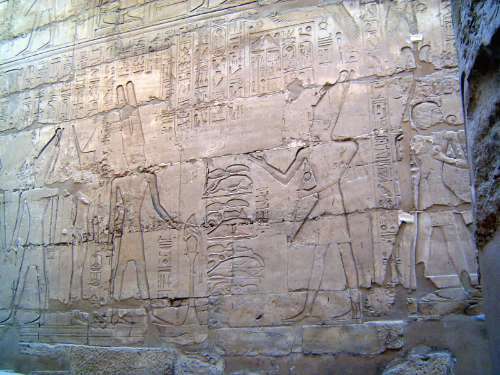 They were made for Amenhetep III and Thutmes IV and installed at Luxor Temple; the usurper Rameses II moved them here. 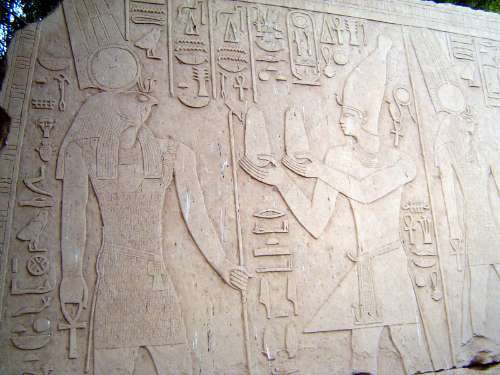 Between their legs are statues of Rameses II as Osiris. Not the way you want to see the place. Look at the end of the sight line and you'll see a architrave across two posts. We'll jump down there and work our way back. 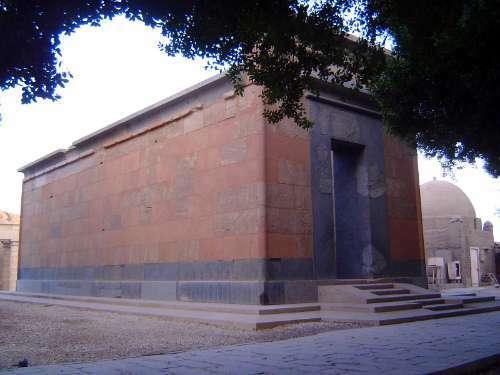 The area is large, with a central enclosure covers 247 acres and, within that enclosure, the 61-acre Temple of Amen-Ra. 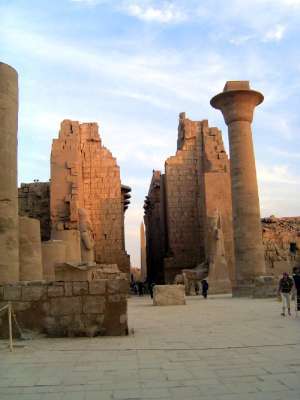 Until a fire in Ptolemaic times, massive gates blocked this sight line. Whew! A bit of privacy, here at the east end of the central enclosure. The view here looks back over the Central Enclosure. 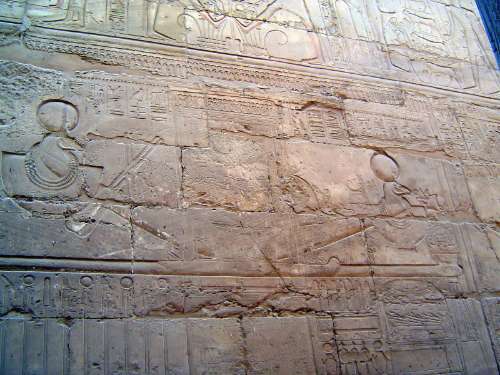 The massively square post-and-lintel building just before the obelisk is the Akh-Menou, the "most splendid of monuments" Festival Hall of Thutmes III. 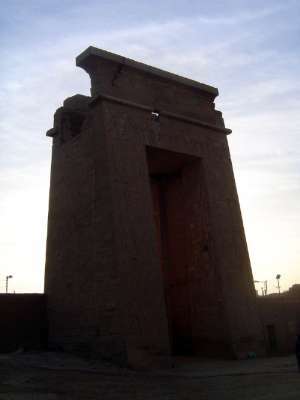 Beyond it are two obelisks, the taller of Hatshepsut and the lower (to its left) of Thutmes. 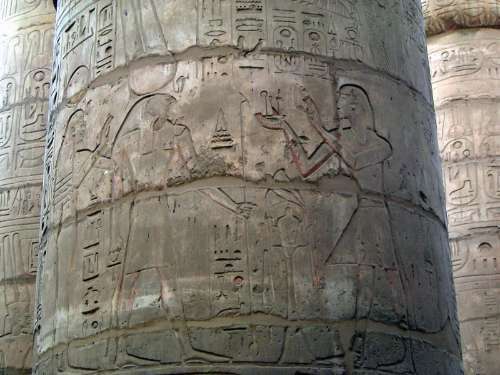 They are in the heart of the Temple of Amun. By one account the temple owned over 700,000 acres of arable land, 80,000 slaves and servants, and 420,000 head of cattle. It accumulated this wealth in part through donations both precious and mundane, including gold, silver, copper, cloth, wheat, and oil. Looking east beyond the enclosure wall. Just dirt? 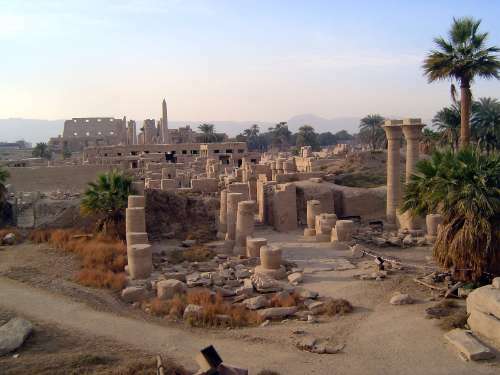 Not quite: it's the remains of a temple built by Amenhetep IV or Akhenaten. We're retreated to the obelisk of Hatshepsut. It's 97 feet high and weighs something over 320 tons. Bare stone now, it was formerly covered with electrum, a gold-silver alloy that reflected the morning and afternoon sun. 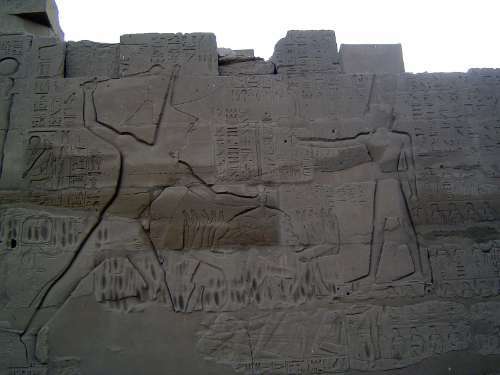 Its west face, lit here, reads: "She made it as her monument for her father Amun-Ra, lord of the two Lands, erecting for him two great obelisks at the august gate "Amun-Great-in-Terror" wrought with very much electrum, which illuminate the Two Lands like the sun" (Translation from R.A. Schwaller de Lubica, The Temples of Karnak, 1999, p. 602). 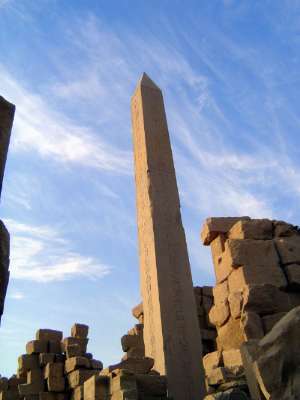 The other obelisk, like the twin of the shorter obelisk of Thutmes, is lost. Here's that massive "most splendid of monuments" Festival Hall. 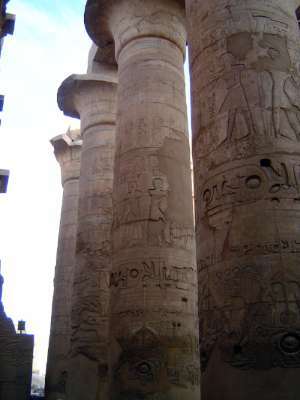 Looking east from that building: two more column types are evident, a polygonal column and fascicular or papyrus-bundle columns. 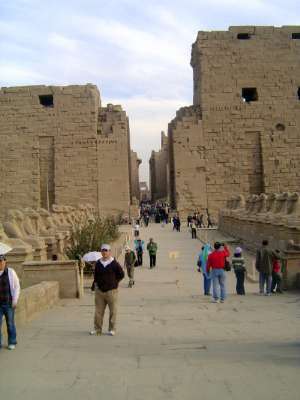 Farther west is the famous hypostyle hall, no longer roofed. 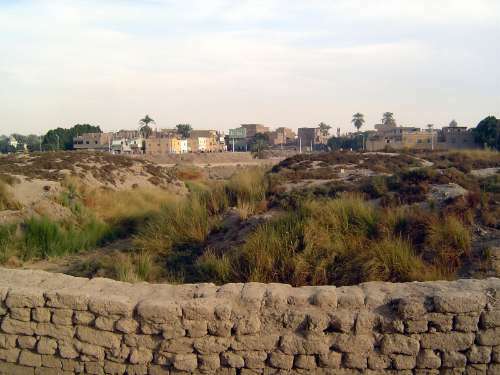 It was a symbolic papyrus swamp, symbolic of that swamp surrounding the primeval mound in which life was created. Until 1925, the annual flood of the Nile flooded this building a yard deep, heightening the sense of a swamp. A roof kept the whole place dimly lit with clerestories. 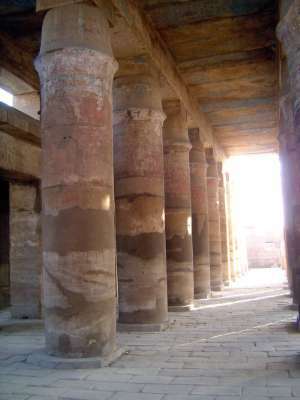 The hall, which measures 172 by 335 feet, has 134 sandstone columns. The two rows flanking the central axis are higher than the others to elevate the roof and allow clerestory light. 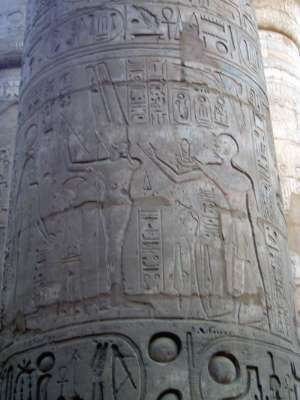 The images on the columns and surrounding walls represent processions, coronations, and, as here, pharaonic offerings to the gods. 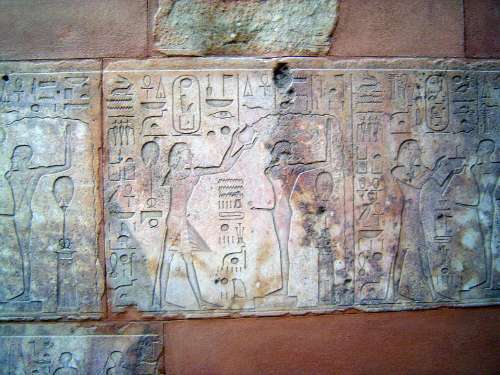 The walls of the hall have similar imagery. 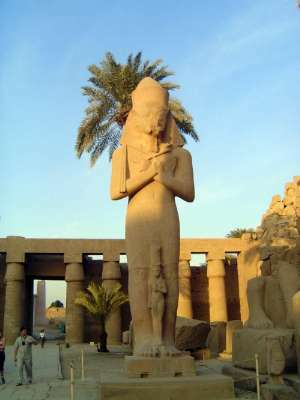 The sacred bark of Amun. 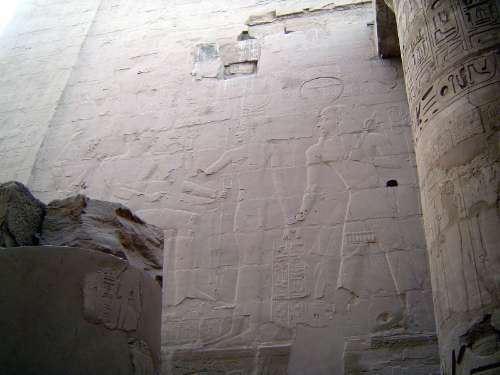 The north wall of the hall presents drawings of a historical and political nature. 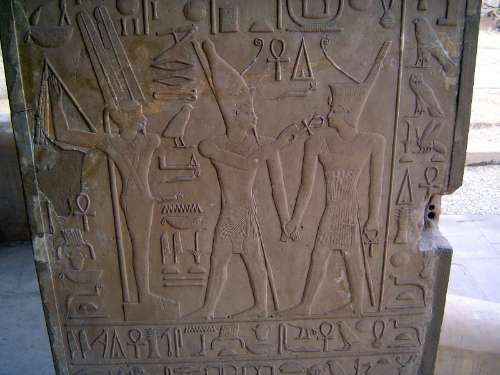 Here, for example, Tuthmose III holds captives by the hair while clubbing them. 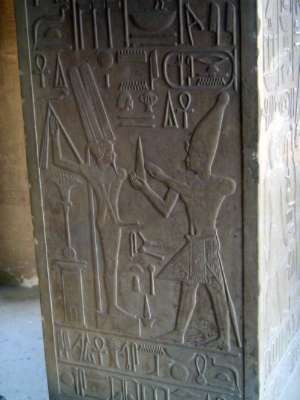 An inscription reads: "He slays with a club the prisoners of the two conquesred nations in the presence of Amunre" (Weeks, Treasures of Luxor, p. 189). 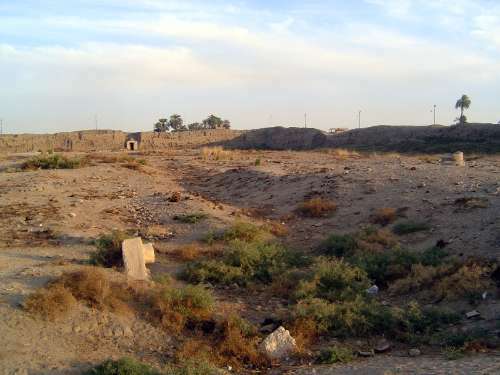 We're come to the southeast corner of the central enclosure, an area where the priests of the temple lived. On this same southern side, but here slightly more to the west, we look north over the Ninth Pylon toward the central axis. 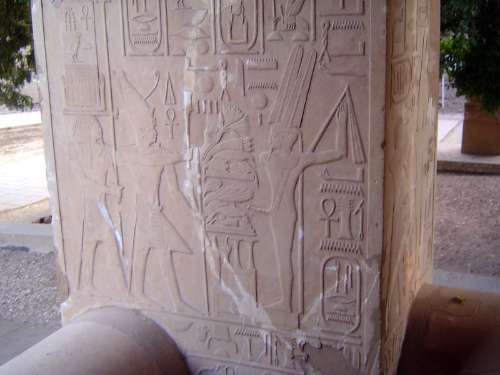 Work on this pylon, marking an axis established by Queen Hatshepsut, is coming along very slowly. Published photographs from 2000 are hardly different than this one from 2008. 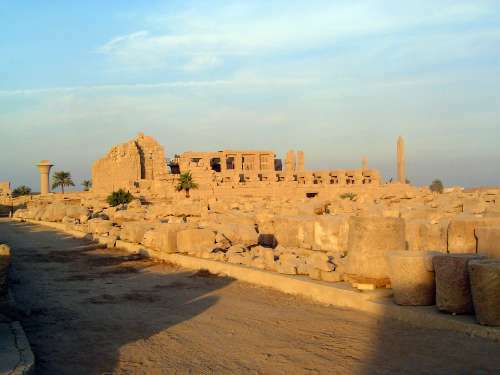 The work is done by the Franco-Egyptian Mission. 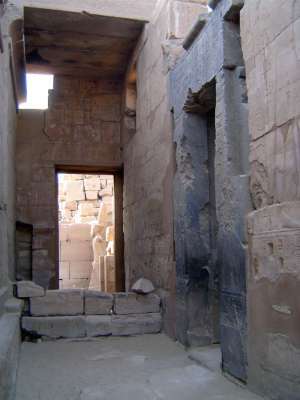 Still farther west in this southern side of the central enclosure is the hypostyle hall of the Temple of Khonsu. Note the four channels to hold flag poles. South of the hall is this gate in the wall of the central enclosure. 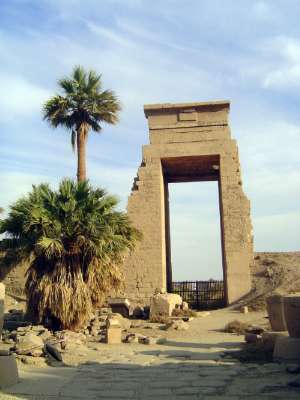 It's called the gate of Ptolemy III Euergetes or the Bab el-Amara. 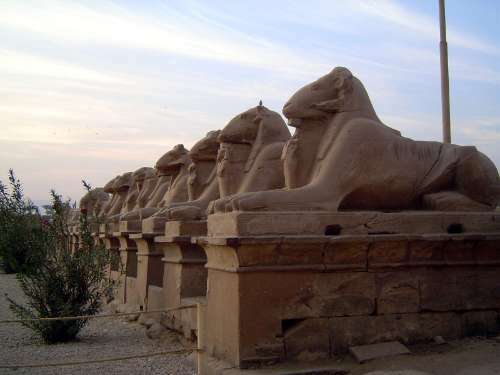 An avenue of sphinxes stretched from here to Luxor. Some survive. 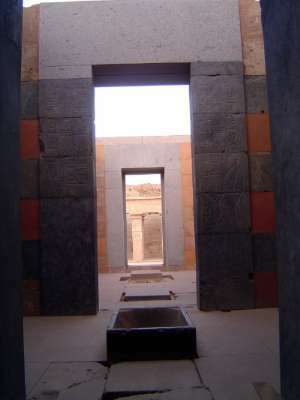 Looking north over the Temple of Khonsu toward the central axis. In the distance on the left is a solitary column. Let's go over there and look east. 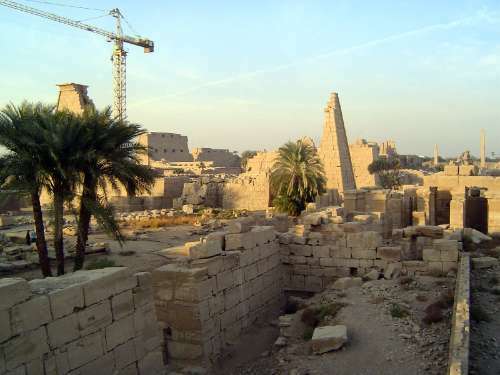 We're back to the central axis, but this time in the second forecourt of the Temple of Amun and looking at what remains of the second pylon. 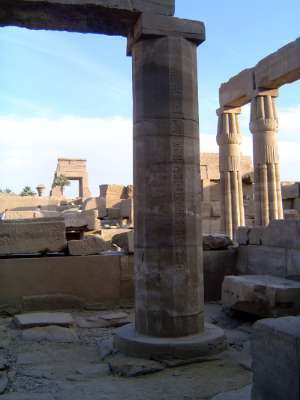 The column is the only one that survives of ten that formed a huge, unroofed kiosk, purpose unknown. 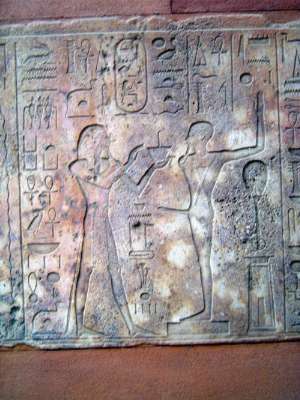 This statue of Ramses II, with his daughter Princess Bint-anta at his feet, stands before the second pylon. It's been moved here; only the feet remain of the original, to the right, which shows the king striding forward. We're in a small building supported by massive square pillars. This is the White Chapel, originally a shrine built by Sesostris I but later recycled as fill for the Third Pylon, from which it was excavated, block by block, in the 1930s, then reassembled. Here Sanusret I approaches an ithyphallic Amen. 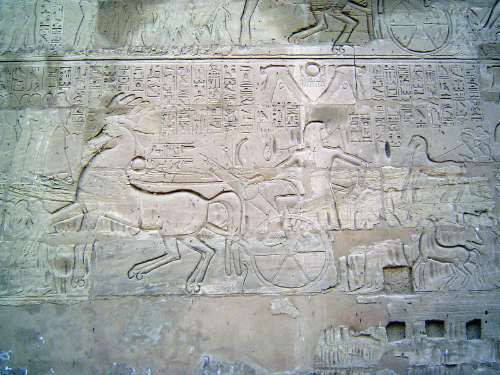 Still another: Alexander the Great offers bread to Montu, the Lord of Thebes, distinguished by the solar disk and twin plumes. 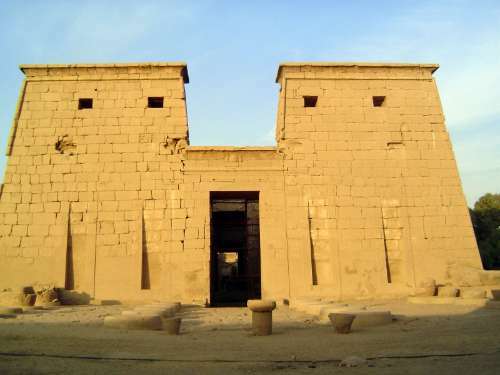 This is the so-called Red Chapel of Hatshepsut, of blocks found in 1898 near the third pylon but only reassembled in 2000. The contrast of red quartzite and black granite is dramatic. Water to wash the god.